WILLEMSTAD - Albert Heyn in Zeelandia no longer exists. Owner Gerard van den Tweel continues under his own name. The store was opened in January 2009 under Dutch Albert Heijn flag. The AH-blue is replaced by purple. And the name has now disappeared from the facade. 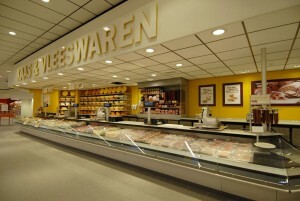 Van den Tweel already indicated at the opening of his second store at Jan Thiel that the name of the popular Dutch supermarket Albert Heijn would eventually disappear, because of disagreement with the mother company in the Netherlands. The supermarket in Zeelandia will continue to sell Albert Heijn products.